I’ve written before about the futility of playing the reach-school lottery— applying to 20 highly-selective colleges in the hopes that one will admit you. 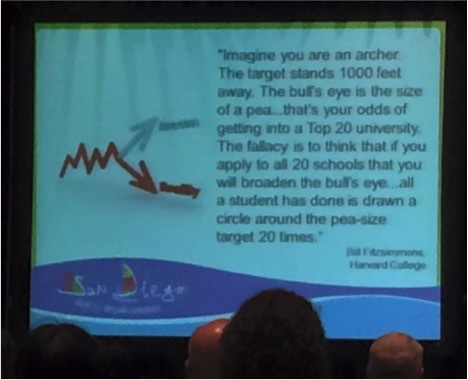 But if you needed advice from a more venerable source than Kevin The Collegewise Blogger, one of our counselors snapped this photo at a session this morning at the annual NACAC (National Association of College Admissions Counselors) conference. In case you can’t make out the source, it’s Bill Fitzsimmons, Dean of Admissions at Harvard University.